Mix cheeses with mayonnaise, Worcestershire sauce and seasonings. 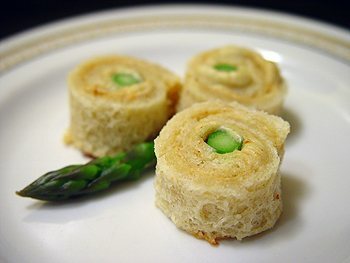 Spread on bread then place one asparagus spear on each slice of bread. Melt the butter and brush bread rolls. Place in a pan and bake at 400 degrees for 15 minutes. From a collection of my mothers (Judy Hosey) recipe box which contained lots of her favorite recipes, clippings, etc. Downloaded from Glens MM Recipe Archive, G Internet..